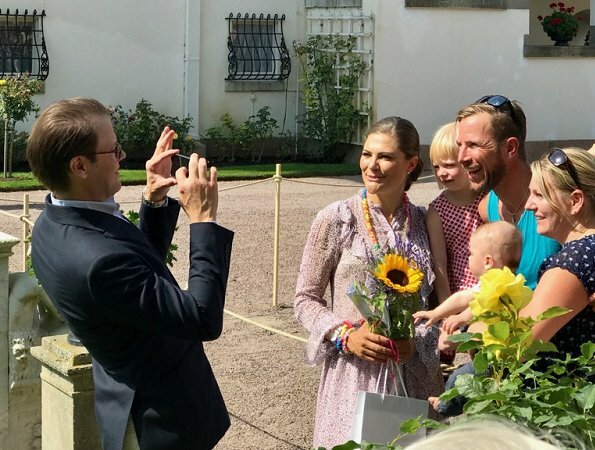 Swedish Royal Family celebrates Crown Princess Victoria’s 41st Birthday. 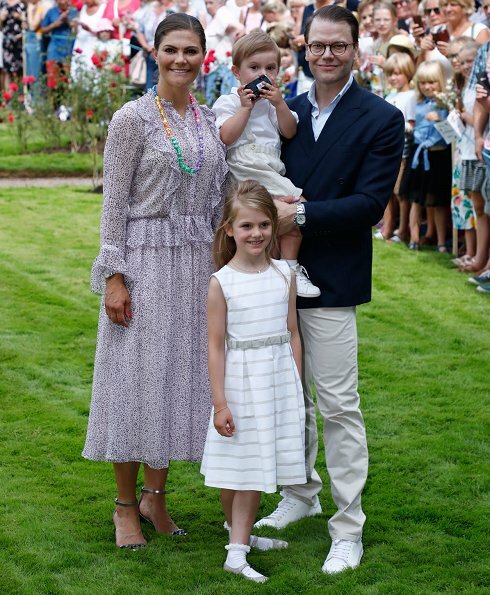 On Saturday 14 July, more than 4,000 people gathered in front of Solliden Palace on Öland to congratulate The Crown Princess on her 41st birthday. 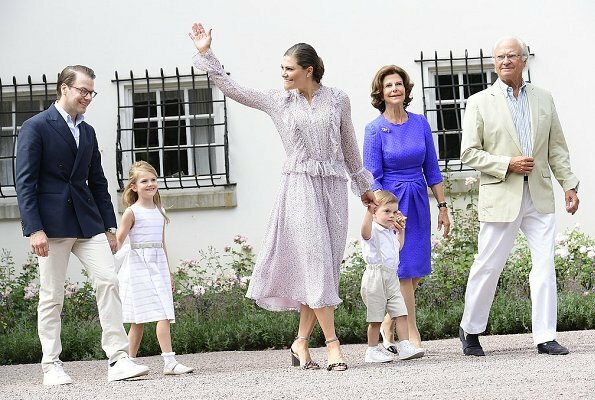 The Crown Princess was congratulated outside Solliden Palace with singing and four cheers, which is traditionally led by the King. 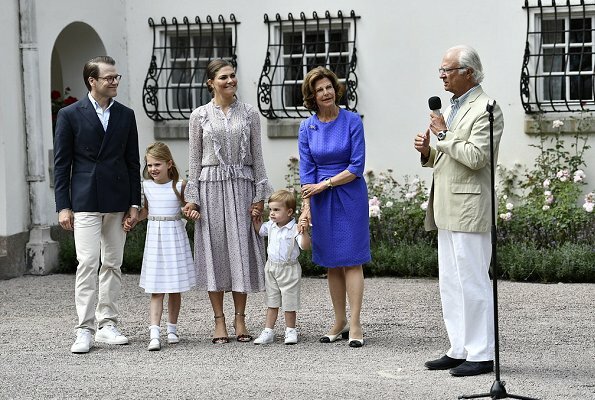 King Carl XVI Gustaf, Queen Silvia, Prince Daniel, Princess Estelle and Prince Oscar also attended the celebrations. Wonderful pictures! How tall Estelle already is! Nice pictures. 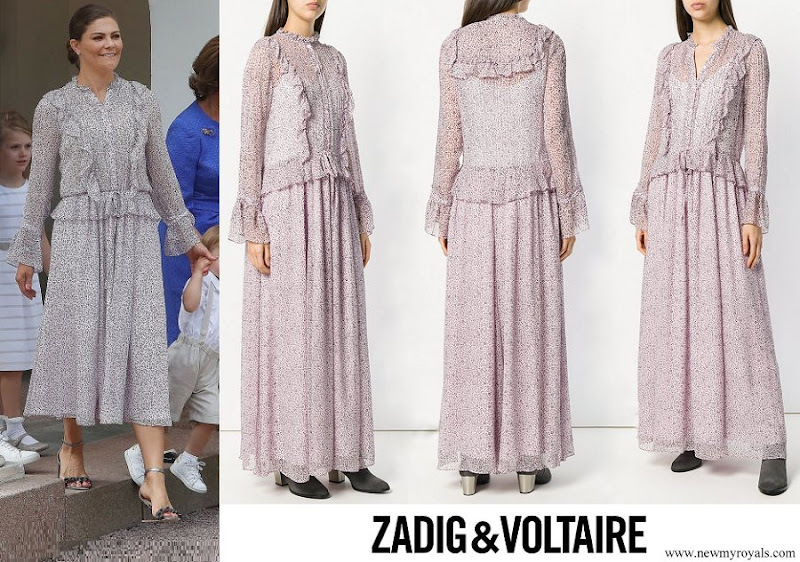 I don't care for Victoria's prairie dress, the length and the print makes her look older but she seems to like this type of dresses. 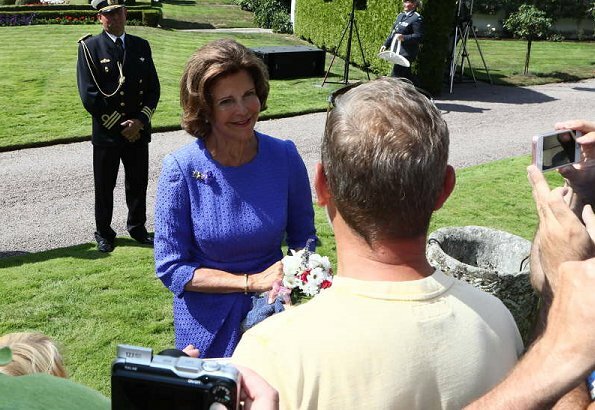 Queen Silvia looks very vibrant and youthful. Estelle's dress is very pretty and she looks cool and lovely, the little boy is cute but still non smiley. Happy Birthday! Estelle is beautiful and so confident. What a lovely family appearance. I like Victoria's outfit and Estelle looks sweet and quite grown up. Love Oscar's little outfit too. Yes, lovely photos of a lovely young family. Everyones outfits are cool and summery. Estelle sure is a cutie-pie. Like Estelle's dress very much- fresh, young, but not too much Victoria's. She dresses 'old' lately. Victoria's dress is so romantic, light and airy. I like the way it was adapted from the model's, adding the cinched-in waist and shortening it. It suits her well. The queen's dress looks more up-to-date than some she has worn recently and it, too, is a lovely look for her. The children are beautifully dressed and seem to be wall-mannered! Good day all around! They all look lovely, and what a beautiful day they had. I absolutely loved Estelle's dress, it's modern with an old fashioned twist. Amd Oscar, oh I adore little boys wearing suspenders. 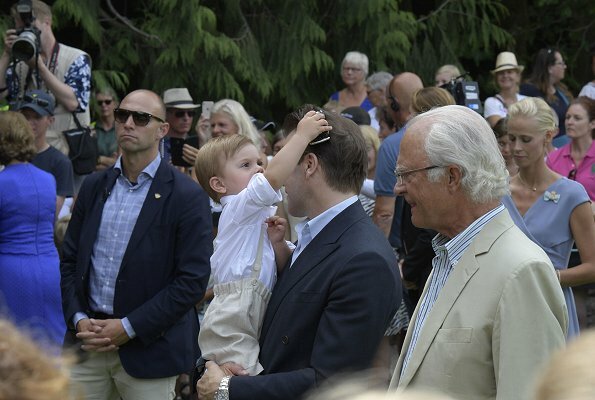 He may look more like his father but I think he has his grandfather King Carl Gustaf's facial expression. They both tend to look very serious when they are actively not smiling or laughing. Some people are just like that, myself included, even though we actually are very happy. 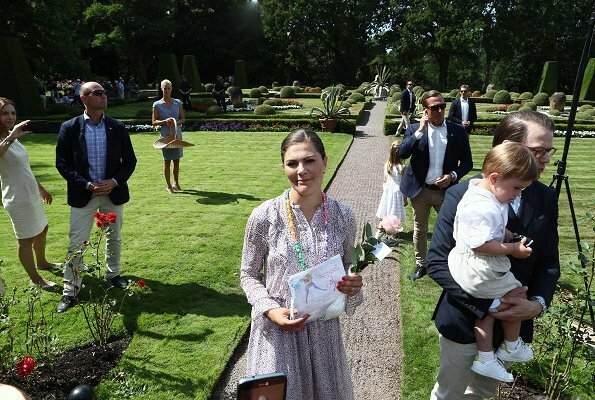 I love how whenever Princess Victoria receives a bracelet or necklace as a gift from a little girl in the audience she puts it on. It shows what a kind and thoughtful person she is I think. A truly lovely family. 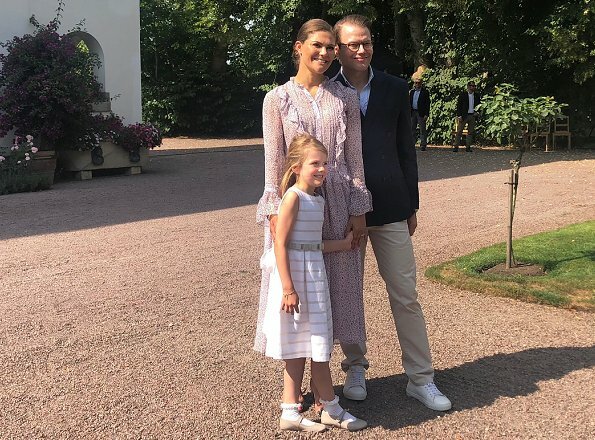 Prince Daniel has shown himself to be a loving and helpful consort to Victoria. The look of love is strong between the Royal couple. Princess Estelle has grown noticeably over this past winter. She seems more settled and happy to share in small royal duties. Young Oscar doesn't seem to be as shy as in previous appearances. They all look lovely and relaxed in their annual summer appearance for Victoria's birthday. Victoria es mi favorita, luce muy comprometida con su trabajo, sin dejar de lado a su familia. La pequeña Estela tiene en su mami un ejemplo ha seguir. Ahora, su vestido no me gusta tanto, pero creo que va con su personalidad dulce y amable. First of all. Happy 41st Birthday.CP Victoria looks happy.Her dress, the pattern is nice,but the ruffles are way to much.Estell has changed a lot, she has grown and her features are not so baby like,she is a School girl now.Oscar seems to be doing it his way or no way, he sure has fun with the car and the ball I think he like's to kick the ball around,or he practice for later,haha. The King and Queen are in good spirits to.Everyone enjoy the beautiful day. This is not the best fit for CP Victoria. In the other pics she looks so lovley with the white-creame-dress. But she can get away with it. Her choices for little Oscar and Estelle are perfect. 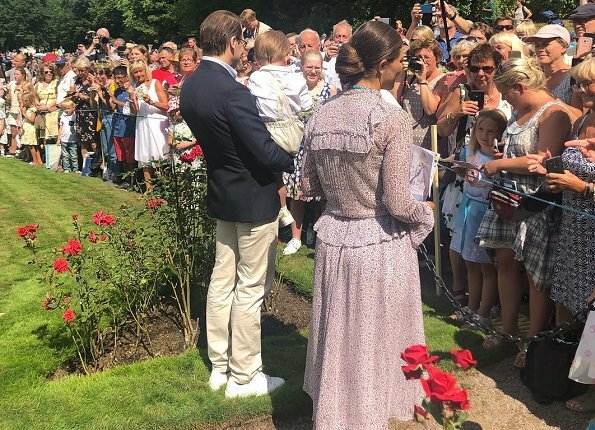 It seems that Victoria is more and more wearing dresses that Mette-Marit would wear, the Little House on the Prairie look. Not a good look, but to each his own. Estelle has grown so much since I last saw pictures of her! I just wish Oscar would smile, but he certainly is an expert at scowling. I guess his sister smiles enough for both of them. Terrible dress on Victoria. She needs clear lines, stronger materials and bolder colours. This does nothing for her. Daniel looks sporty with his trainers. I wish he had left his jacket at home, or at least worn it unbuttoned like the king. But I like the colour combo of off-white with navy. Lovely family. Wee Oscar is brilliant, always so solemn. I think he looks very like Estelle at that stage. 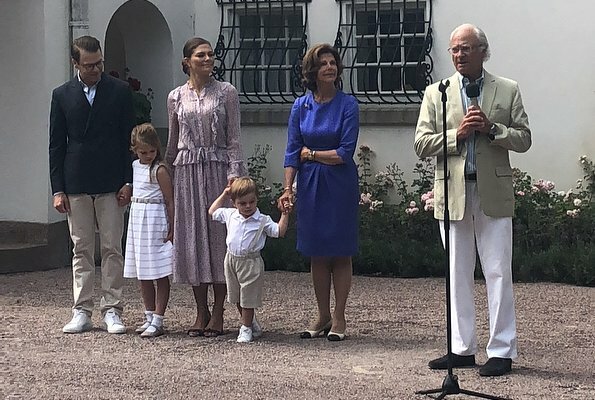 Estelle suddenly looks so grown up and Queen Silvia looks amazing. Not a fan of this dress on CP Victoria---too pale and too fussy. However, she looks happy and the people clearly love her. Hope she's had a wonderful day. Victoria comes across older than she is because of her clothing and severe hair. This dress is another example of poor style. I would like to see her in shorter, more fitted dresses with simple lines. And wearing her hair down would really soften her appearance. The queen has it right. She looks great. I love seeing Daniel wearing his kicks. He sets the perfect tone. The children are precious! Terrible dress and shoes on Victoria. And wrong hairstyle for this prairie dress. Very agening look. Her 74-year-old mom looks much better. Estelle looks like a little lady with her hair down. Very pretty dress. Why Victoria didn't choose something simple and with clean lines instead of this ruffle horrors. Don't be so tough Anon9.51. I think the dress is nice even if it is not the best styling for her, but think she cannot stick exclusively to one style, it would be so boring. The dress suits perfectly for the occasion. As usual it is the hair styling which doesn't serve her as it should, what can we do? She can stick to one style, think of her hairstyle for example, always combed over her head and tightly slicked down. As to her dress, the designer just ruined this fabric with all those ruffles. Less is more and clean lines would have been better. And this kind of midi dresses is something she has started to favor if late. This style ages her! Ah, it is HER birthday and she wants to feel romantic and sweet, I think. Why not indulge this on her special day? She has business outfits for the other days and this one is just for pretty and fun, maybe. A little twirl to shrug off getting older? 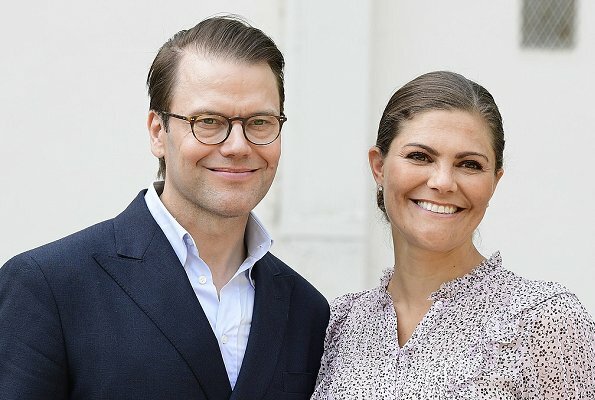 Dear Princess Victoria of Sweden, May your 41st birthday be filled with peace and love. She looks better in simple clothes, higher heels and pony tail. Her style used to be better. Now it's like someone told her, Victoria you are older, and she started to wear granny dresses and awful buns. Her style was the best when she gave birth to Estelle. Anyway, beautiful family, beautiful smiles, beautiful country. Happy birthday!!!! What wonderful pictures of a beautiful family. You can feel the love between Victoria and Daniel and it comes across in their children. Both Estelle and young Oscar have grown so much this past year and Estelle looks like she's beginning to understand her role in the family. I love her dress. With her long hair it gives her a country girl look. Oscar and his suspenders are very stylish and his little face is filling out he looks to be enjoying the festivities. Queen Silva looks lovely in her blue dress. The color suits her. 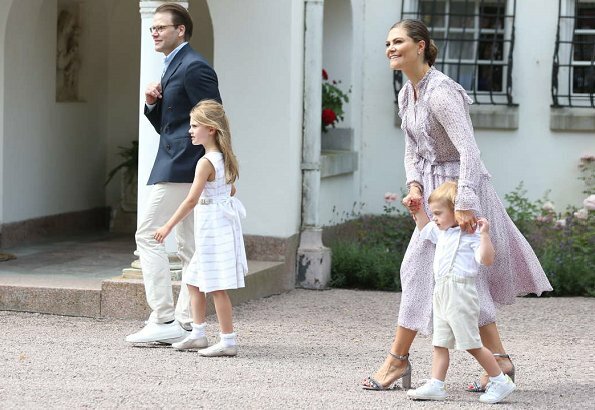 It is very obvious the people of Sweden love their Royal Family. 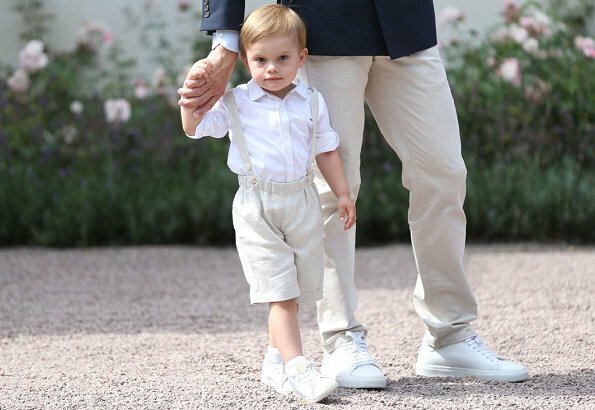 OMG... Is this young man realy Prince Oscar? But he was a baby only yesterday! When he had grown up?? ?